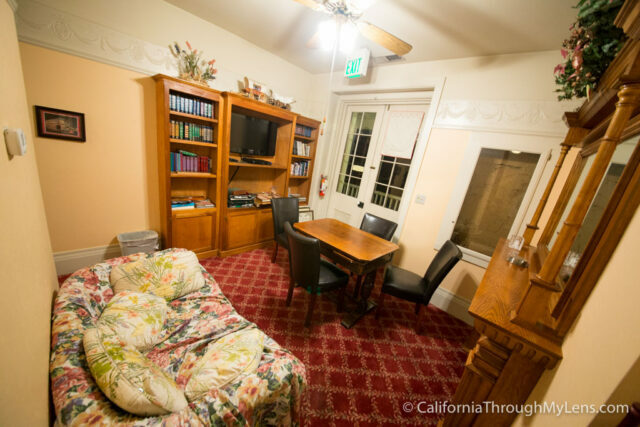 Located about 23 miles from the east entrance of Yosemite, the historic Groveland Hotel is a really fun spot for a unique vacation. This hotel has two parts which are both on the historic register, one which was made in 1849 and one which was made in 1914. Both are still run to this day in a way that makes you feel like you are experiencing a part of the hotel’s history. Sure this hotel is not one where you will find all of the amenities that you can find at a Hilton, but the old world charm should win you over. 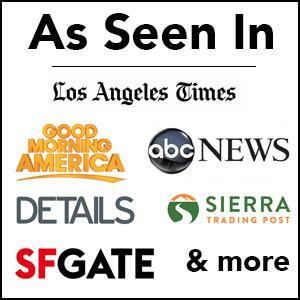 I truly enjoyed my time at the Groveland Hotel, here is all the info. 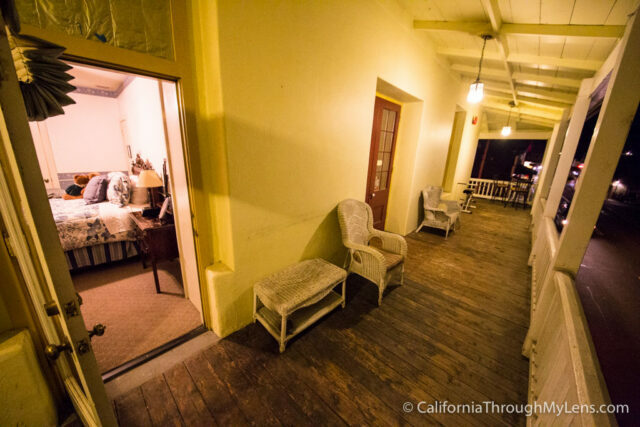 The adobe building that makes up the oldest part of the hotel was built in 1849. Over the years, it changed hands with the times and was everything from a hotel to a gambling hall and a restaurant. The area and hotel became especially popular with the rise of Yosemite as a place for people to visit and the early mining boom in the area. The add-on building was designed in a Neoclassical style and was used to house members of the executive team when the Hetch Hetchy dam was being built. There was even an 112 tent encampment in the back of the hotel that housed the dam workers. In 1990, the hotel was bought and went through a 1 million dollar renovation to become what it is today. 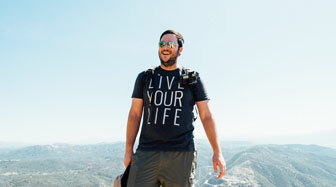 The hotel itself is located at the end of the small town of Groveland, on Highway 120. It has a distinct Colonial style and is a really beautiful property. There is parking for the property in the back and the rooms are located right above the check-in area for the adobe part of the hotel and next door for the newer section. 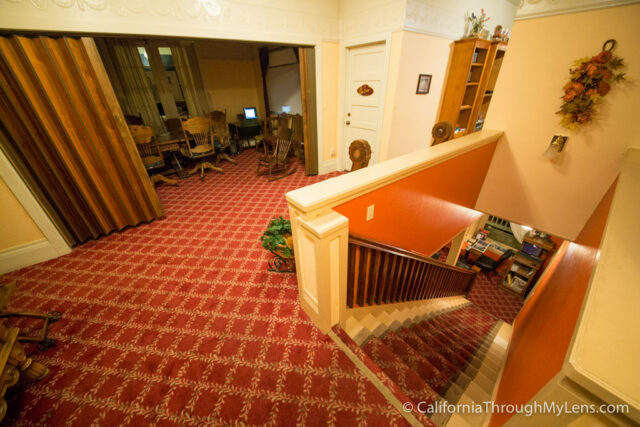 I stayed in the adobe portion, which has a staircase that heads up right from the dining room. The upper area has lots of different places to sit and relax with tables, chairs and a fireplace with games. 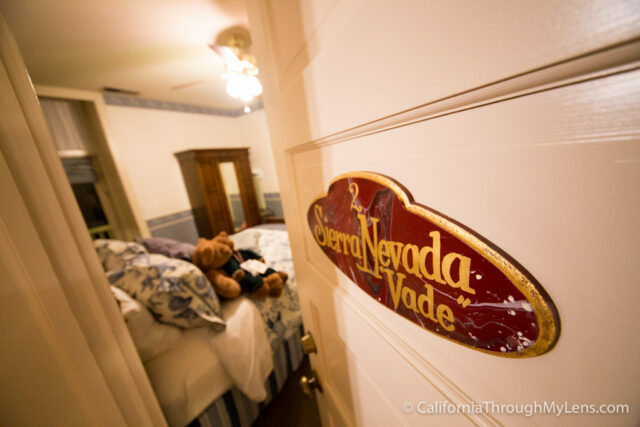 There is also a large veranda that has more chairs and connects to one of the rooms, the Sierra Nevada Room. 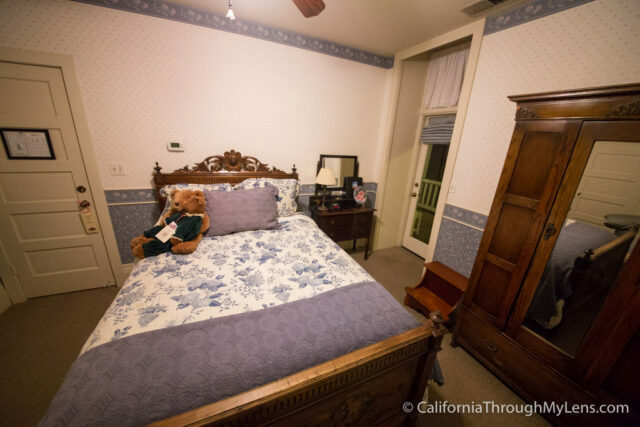 The rooms themselves all have a different style with antiques, small TVs, a coffee maker and a bathroom. 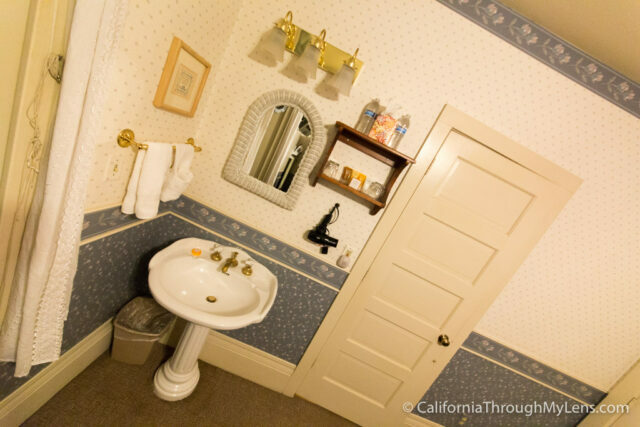 I thought it was interesting to see the sink on the outside of the bathroom and with a carpet floor beneath it but it added to the old charm. 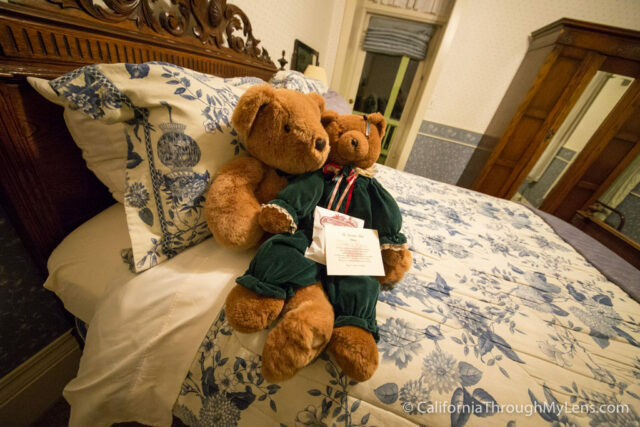 They also had bears sitting on our bed to greet us and robes in the closet. Our room was attached to a second story walkway that wrapped around the hotel and it was a nice way to get some fresh air and look down on the small main street. 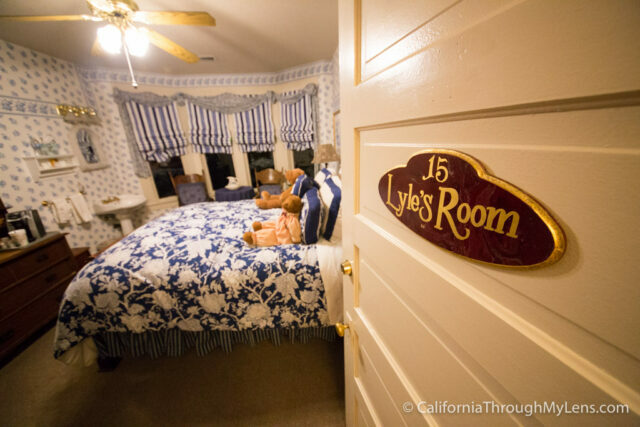 I also got a chance to see the “haunted” room on the property called Lyle’s Room, named after the ghost who haunts it. The story goes that Lyle bought the room when he was mining here and used to sleep with a stack of dynamite under the bed. He eventually passed away in the room and now haunts visitors that stay there, usually by dimming lights and knocking make up off the dresser. This is the most popular room in the hotel as people want to stay in it and see if they can meet Lyle. 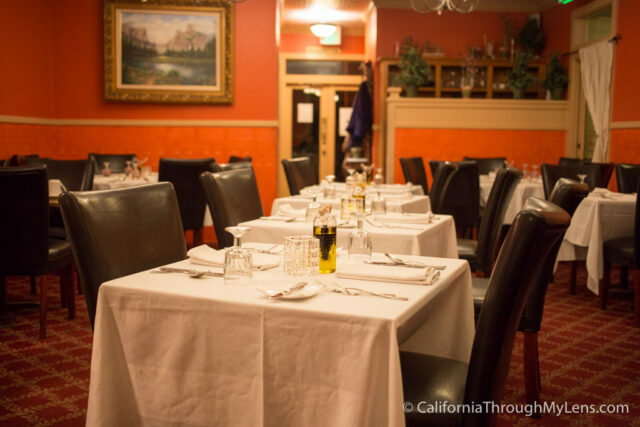 If you are staying in Groveland, then there are not many options for you with restaurants, that’s not a bad thing though as the Groveland Restaurant is fantastic. I had dinner there when I stayed, here is what we got. The bread they bring out while you are waiting to order is made fresh and it comes with oil and vinegar. It is a really good starter. 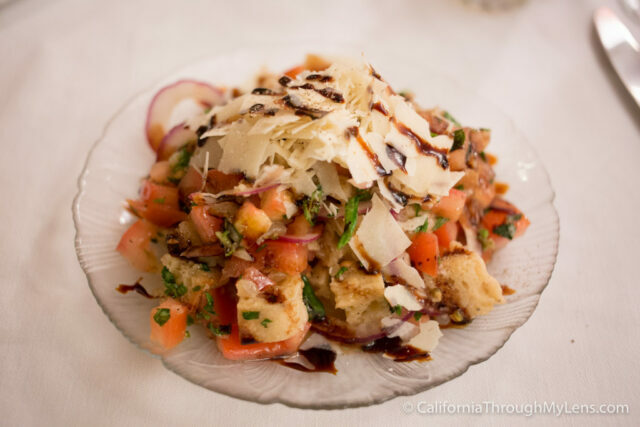 For salads, I went with the panzella which is a bread based salad and which was very strange but good. Kind of like a Caprese salad with bread instead of cheese and I appreciated that they were trying something different. 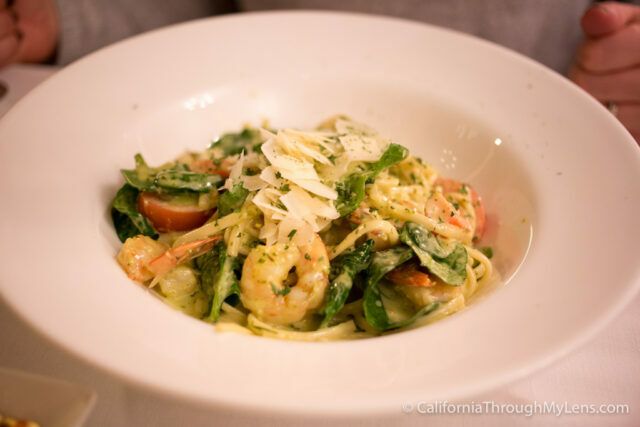 My wife got the pesto shrimp pasta and said it was fantastic as it has fresh tomato and spinach which complimented the creamy pesto. It was rich but the flavors were well thought out. 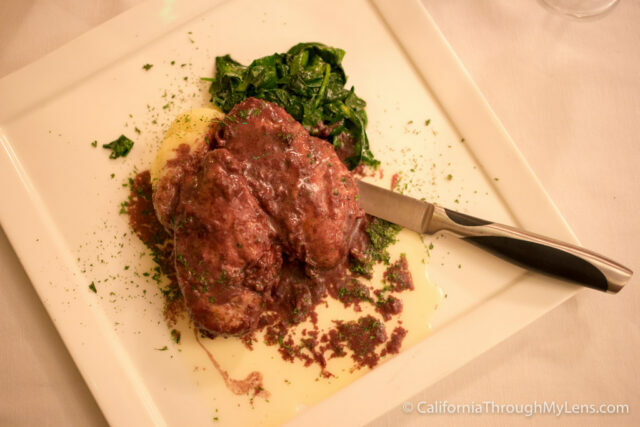 I highly recommend the chicken though as the burgundy sauce they put on the top is delectable and I was really impressed with how good it was. I asked the chef what makes it so good and he said that wine, wine, and more wine is why it’s good and I can see why. If you don’t know what to get this is what I suggest. 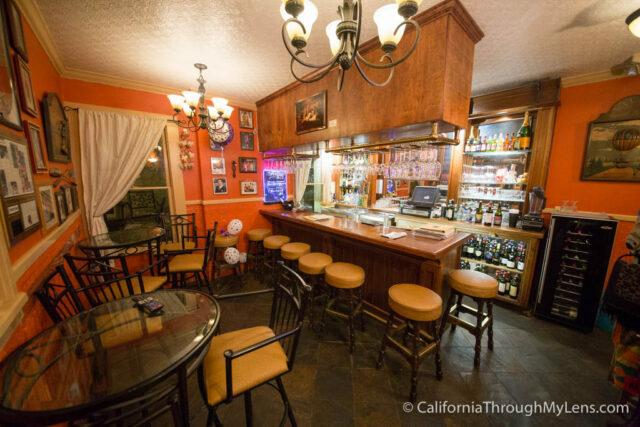 There is also a small bar attached to the dining room if you prefer to have a drink before heading up to your room. All in all my time at the Groveland Hotel was short but memorable. These historic hotels are not for everyone, but I for one really like staying in such a unique spot and learning about the different lives and people that shaped this state. 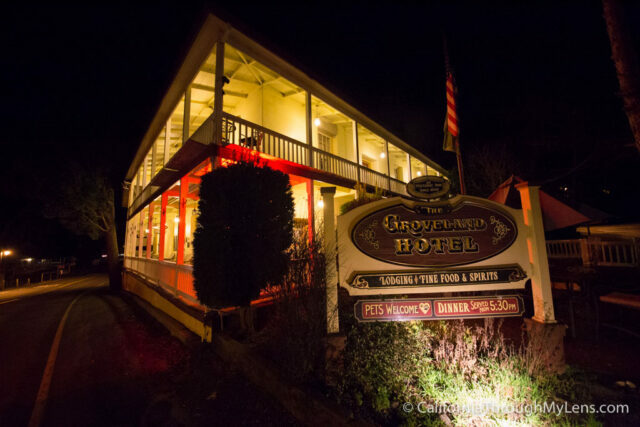 If you are heading to Yosemite from the Bay Area, then consider spending a night or two at the Groveland Hotel. Let me know your thoughts in the comments.